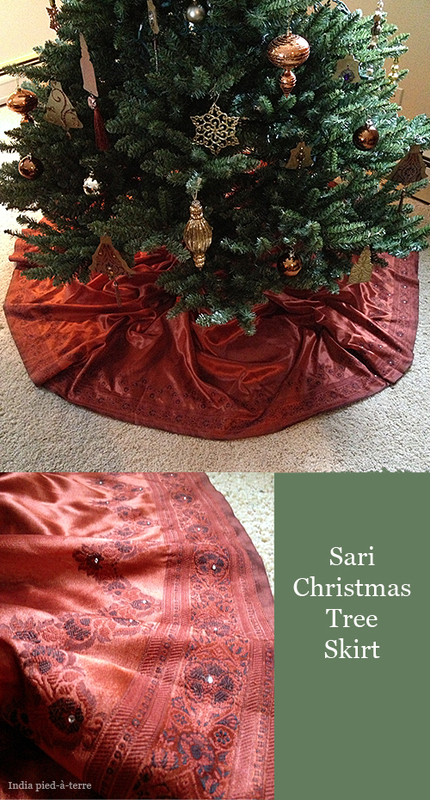 Sari (or, saree) cloth is perfect for Christmas tree skirts. It can be glittery and sequiny. It can be woven with gold. Yes, sometimes real gold. What’s more festive than that?! 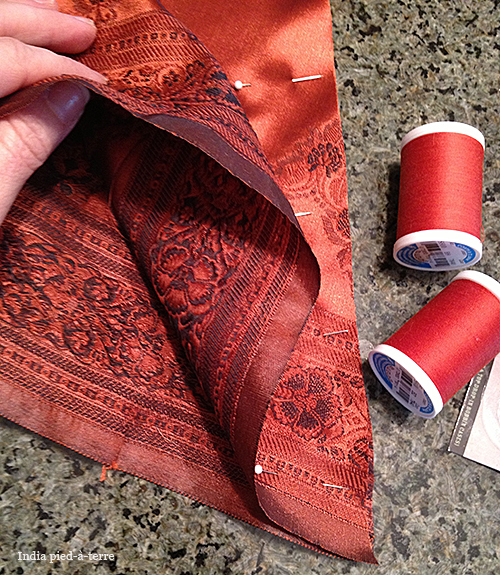 You can easily find inexpensive vintage sari fabrics on eBay and Etsy for this DIY project. 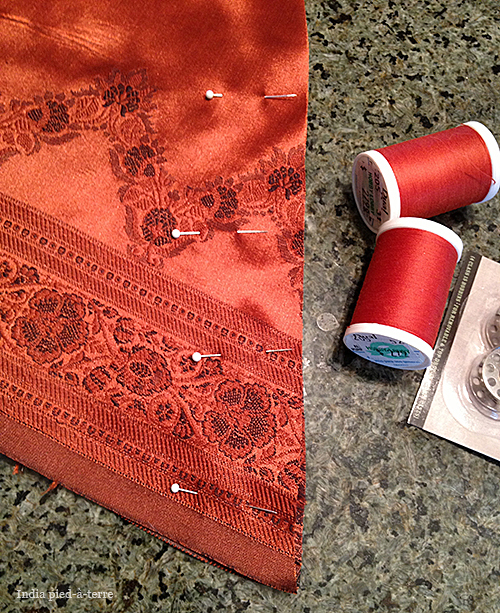 Saris have many yards (or meters) of fabric so they’re perfect for projects like this that need a good length of fabric. 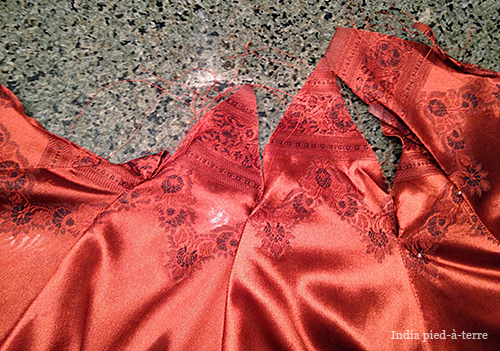 For this project, it’s best to choose a sari that has the same border on both edges. Because the long edges you see in the diagram above will become the outside border of your Christmas tree skirt when it’s done. Do you see the different pattern on it at the bottom of the photo? 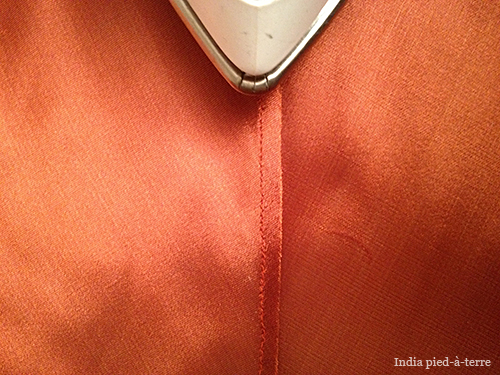 That’s called the pallu – it’s the part of the sari that, when worn, goes over the shoulder and cascades down the back. Sometimes it is decorated more than the rest of the sari. 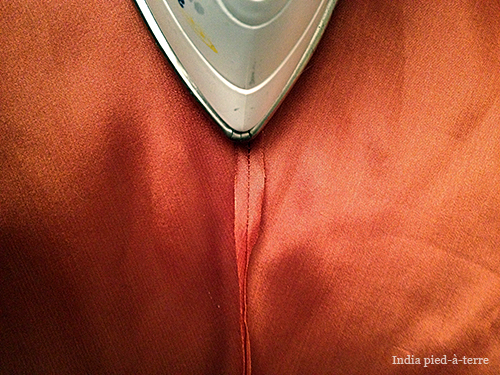 If it is, you can work the pallu into your skirt design, or you can cut it off and save it for another project. 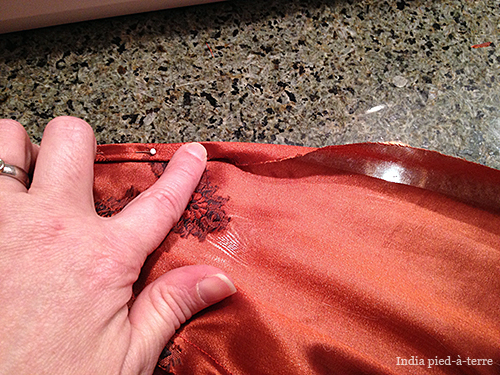 Saris might also come with blouse fabric attached, as mine did. See the square of fabric with my sari, the one with a different design? That’s used to make a blouse to wear under the sari. You can use it for your tree skirt, or save it for something else. I’m going to make a pillow with my blouse fabric. 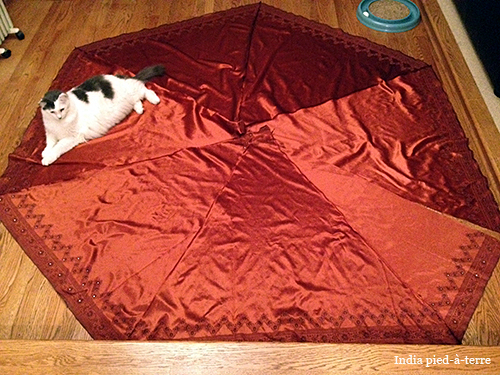 So, now that you know the parts of the sari, lay it out flat on the floor, as much as you can. 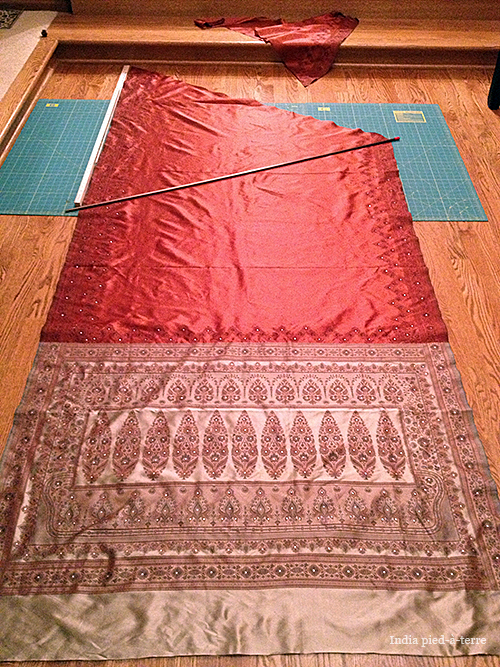 It’s very long and you might not have space to unfold the whole sari, but that’s okay. You can unfold the sari as you go along. I like using rotary cutters for projects like this, more than scissors, because it’s fast and easy to make long clean cuts, and the fabric is less likely to shift out of place because there’s no scissor blade lifting it up. 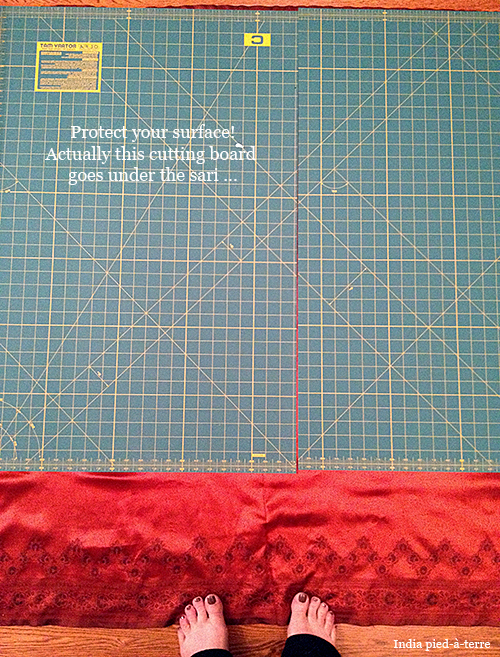 But I caution, if you use a rotary cutter for the first time, it’s sharp! Seriously. If you touch your finger with it, you’ll bleed all over. These rotary cutters are so sharp that one seamstress could decapitate an entire army of young buff men in one swoop! I’m only barely exaggerating. 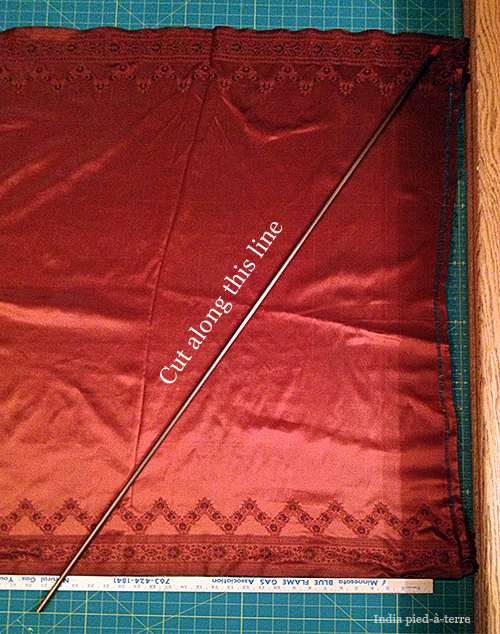 So to protect my wood floors, there’s a cutting board under the sari cloth. Protecting fingers involves extreme caution – just keep your hands out of the way of the blade. And whenever you set the blade down, push the protective cover over it – it’s really easy for a child or pet to come along and get cut. 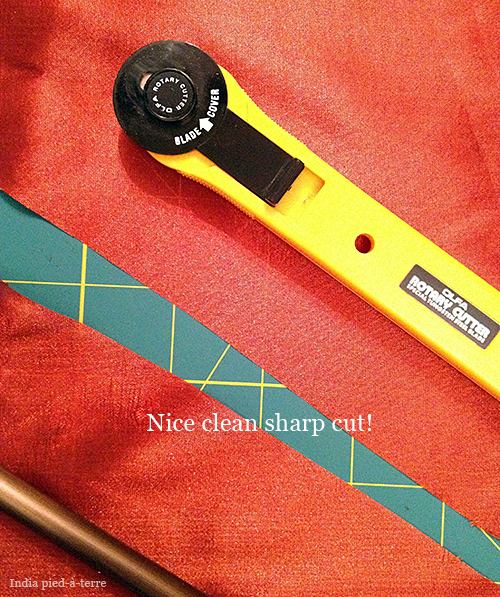 I share all these tips because table saws don’t bother me nearly as much as rotary cutters do – it’s super easy to get a bad cut. You should have a wedge shape. You can move this out of the way. 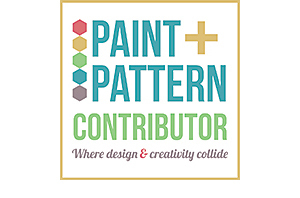 Cut along this diagonal line. You should have your first triangle shape. 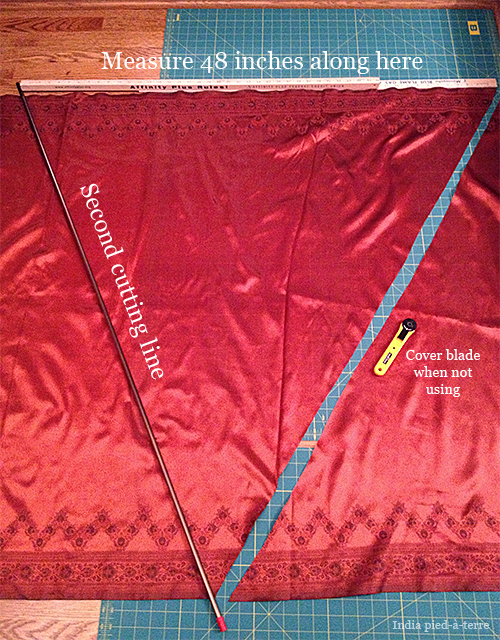 You’ll be cutting four to five more of these – however many you can cut from your sari cloth. Cut along the diagonal line. Keep repeating these steps until you have five triangles. You can see I’m getting close to the pallu. 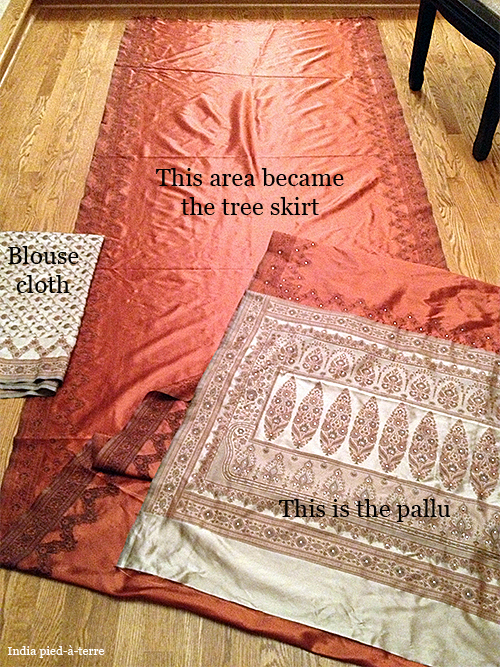 You can include the pallu in your skirt, but I didn’t want to. I was able to squeeze out one more triangle, for a total of six triangles which is ideal because it will make a full circle. If you cannot cut a sixth triangle, you will still have a skirt around the tree, it will just be a little less full. Cut along the straight line. If you have a pallu and blouse fabric left over, set those aside, we won’t be using them. 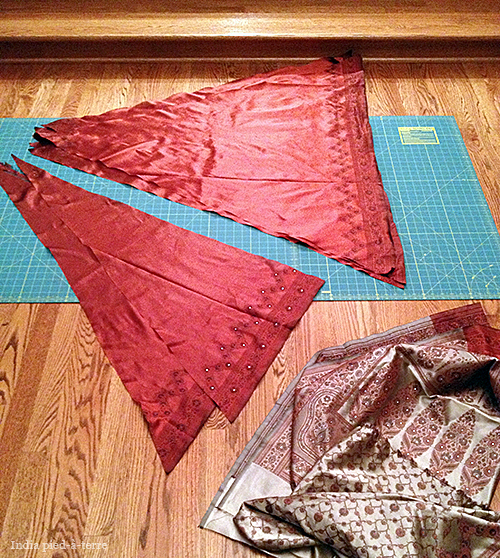 Now we’re going to start sewing the triangles and wedges together. Now you might be thinking, wait a minute! But won’t the messy seam show on the outside? Yes it will. But only for a moment. Not forever. It’s not time to panic yet. This is not a mistake. If you’re an experienced sewer, you know where I’m going with this – we’re going to make French seams. If you don’t sew much, just follow the steps in the video below – you will end up with a tree skirt that looks nice and clean on both sides, instead of having raw edges on the bottom. 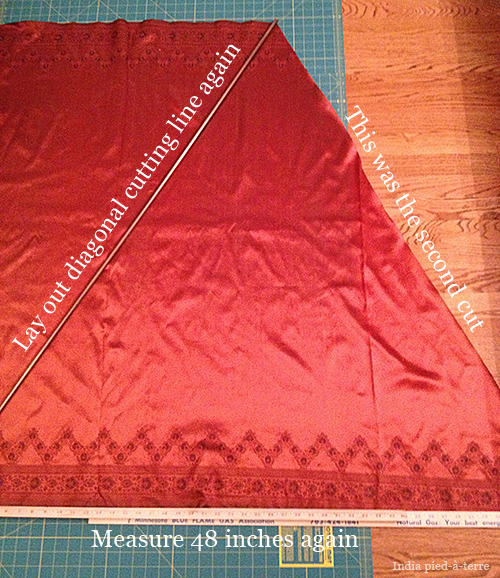 Because you’re sewing on a diagonal, be careful to not stretch or pull the fabric. It can get pulled out of shape pretty easily and then it will pucker and that will be hard to iron out. Just handle the edges carefully, and don’t pull the fabric through the machine with your hands, just let the machine pull the fabric. 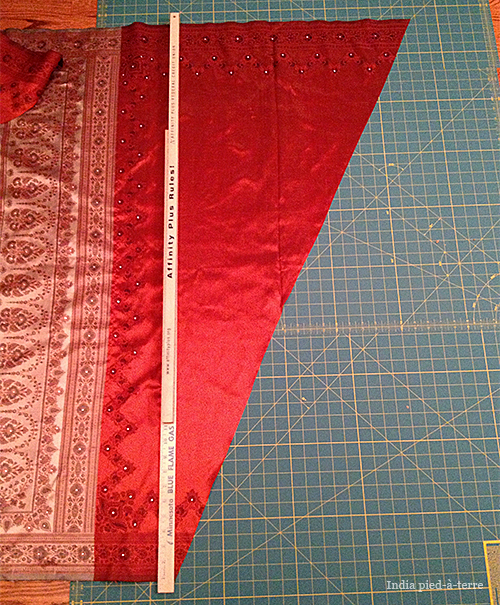 Sew all edges together with these French seams, except two edges. Leave two edges unsewn for a moment. Because you will need an opening to get your skirt around the tree trunk. 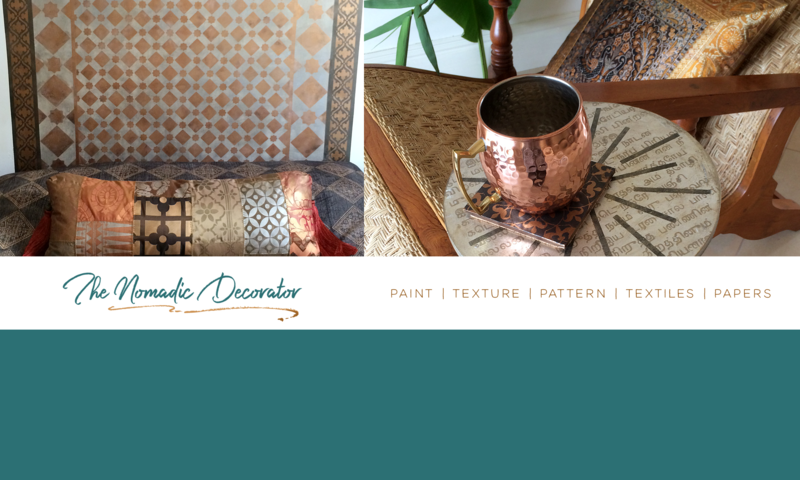 If you’re an experience sewer, you can finish these edges in many creative ways, even with nice ties or bound with contrast fabric. I’ll be hiding these seams behind the back of my tree so I’m not going to get creative with them. 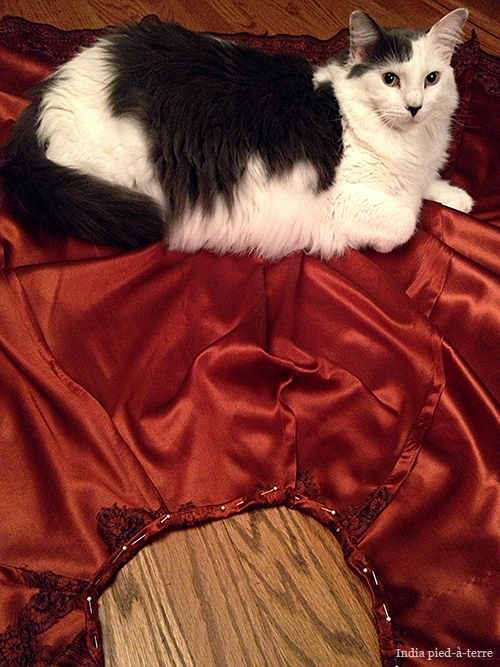 Every time I set the fabric down, this little guy was on it! He was so enjoying watching the whole project from start to finish, I don’t have the heart to crop him out. 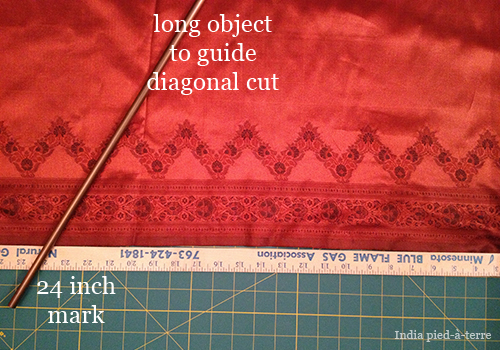 I hope you stuck through these steps, because if you did, you now have a sari Christmas tree skirt! Beautiful material! I appreciate the tutorial. I used to sew a lot, I could do this again. Still have my 1970 heavy-duty Sears all metal sewing machine, LOL! I’ve been lazy, though, and until a few years ago when I broke down and finally purchased a beautiful satiny and velvety tree skirt at TJMaxx for $19.99 (I felt it was an absolute STEAL, as the skirt is really lush and beautiful), I used to scrunch up a Christmas tablecloth underneath and around the tree to hide the base. 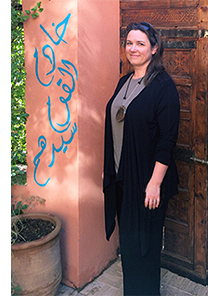 Easy-peasy and inexpensive. But it left something to be desired. There is nothing quite like a tailored look! Yes, you could just wrap a sari around the tree without any sewing, but you’re right, there is something about having it with seams that make it naturally go around! Next PostNext Merry Christmas & Happy Holidays!